When the developers of Mirror’s Edge Catalyst introduced their new game at E3, they mostly focused on how players would be free to explore a large open world. Cool, I thought. Good. This is a good thing. During my brief time playing Catalyst after that demonstration—our remaining minutes precisely marked by a screen-corner countdown timer—that openness was front and center, albeit limited by the constraints of a show-room demo. I’m not sure how well the final version of Catalyst will hold together, but I’m very glad it’s open world. The first Mirror’s Edge, released all the way back in 2008, had some fine ideas. It did first-person parkour in a way I had never seen before. It had a nifty focus on putting me “in” the character I was playing, watching her arms and legs brace and counter as I leapt between buildings and kicked open doors. But over the course of the game, I rarely had a chance to breathe or to experiment. Each level was resolutely linear, and each was possessed of an often overwhelming momentum. Faith, the protagonist, would be given a waypoint. There would be some enemies on her heels. There was little time to take in the sights, and even less space to make (and learn from) mistakes. Catalyst’s E3 demo played similarly to its predecessor in many ways. The daytime city was still stark white, highlighted with bold primary colors and red-highlighted objects showing you possible routes to your next objective. The control scheme was familiar, with the left trigger governing “down” actions like sliding and rolling, and the left shoulder button triggering “up” actions like leaping or vaulting. You could hit the right trigger to bash open a door, and use one of a couple of possible contextual attacks to take down and bypass armed enemies. After a brief tutorial mission that showed Faith being released from a government internment camp and quickly recruited by a member of the underground resistance, I was set loose in a limited open rooftop area. After that, I undertook three side missions—a race from point A to point B, an environmental puzzle that had me climbing a building to get to a billboard up top, and a combat-oriented chase sequence that had me punching my way past a few guards while making a delivery. None were exciting on their own and all three seemed like the sorts of filler missions that we often see in open-world games. But in between challenges, I could simply leap and bound from roof to roof while trying to collect floating golden orbs. That openness was very appealing. I have reservations about the rest of the game. The story stuff I saw lacked subtlety or nuance—Bad corporations are bad! Cool cyberpunk resistance is good! I feel like I can already predict the whole story—Faith joins with the resistance! They fight the bad guys, and eventually a main resistance character betrays them! The leader of the bad guys tells Faith they’re not actually so different! I’m also not convinced that the simple sidequests I did will remain interesting for long. I hope that the finished game has more depth to its side challenges, and that they’re organically folded into the natural rhythm of exploration. I spent the most of my limited time with Catalyst simply running around, trying out moves, and getting a feel for controlling Faith. That is the thing I never felt like I had space to do in the first game. I liked that the first Mirror’s Edge was, more or less, a game dedicated to repeatedly recreating the opening chase sequence from The Matrix. But I’d also have liked more space to experiment and master its distinctive control scheme. 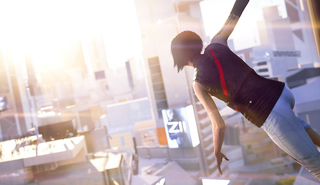 Mirror’s Edge Catalyst looks like it’ll give me just that. It seems more skate-park than racetrack, which is what I want.